As THAT nerd in design school who did all the sketching and planning that you're supposed to do, I've got a stash of vellum, sketchbooks, chart and grid paper and all sorts of drawing implements. As a letterpress printer, I've longed for paper gridded to the pica. Tired of wishing for it, I finally made it happen with new pica paper pads that are available here. Every time I teach a class, I try to mercilessly beat into the heads of students that doing the math is key to successful layouts. 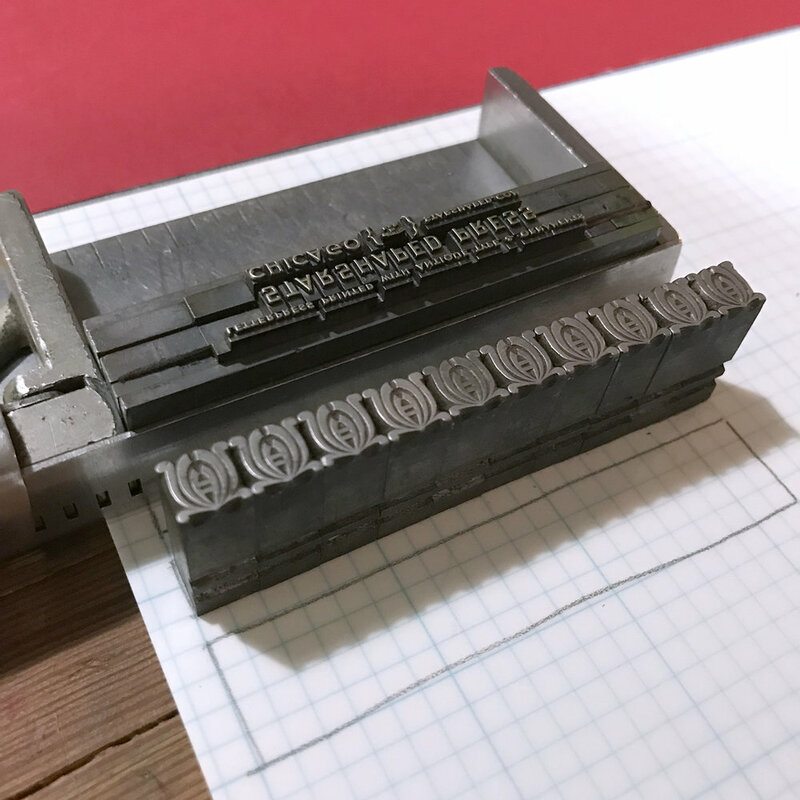 If you're just starting out or trying to improve your metal type setting skills, remembering to measure is the thing that will help your speed. And as you get printer math burned on your brain, you'll need to map it out a little less and less over time. That said, I still sketch out ideas for 90% of my projects as seeing it first helps me determine if it's possible and what the challenges will be. 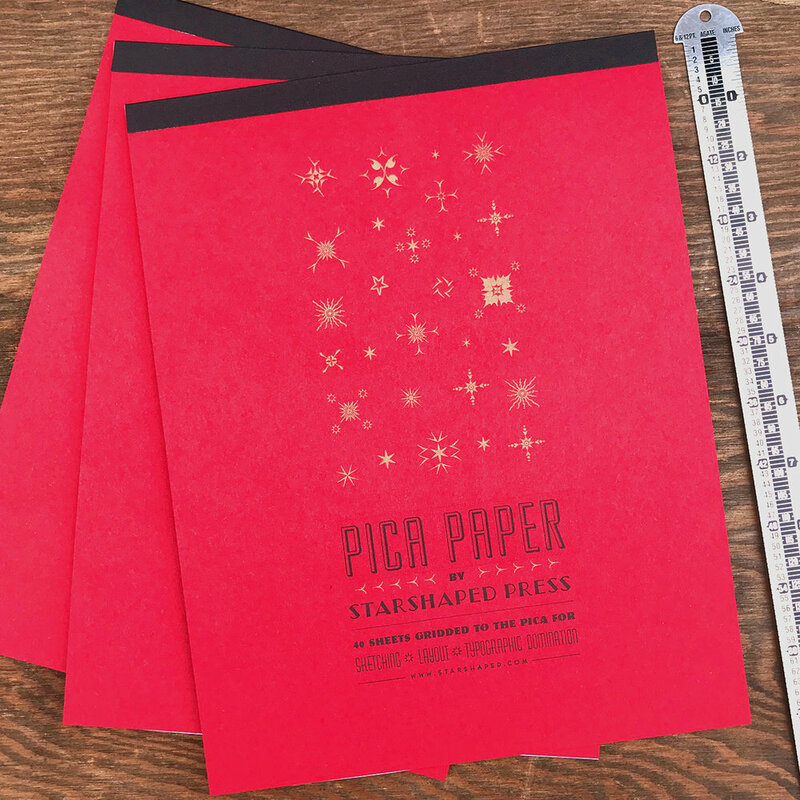 The beauty of pica paper is that it perfectly matches up with composing sticks and line gauges. You can map out a layout where text will fit a certain block and then determine the ornaments that might fit with it. I often build forms right on top of a sheet of graph paper that's placed on a galley. This way I can use it as a guide and slide it out when the form is built. Here's a quick sketch to show how easy it is to build simple ornamental forms and how to consider both design and spacing options. As per this post, working with ornaments that 'play well' together is a great way to start. I've sketched out a plan for ornaments here by size and you can easily see how sizes divisible by 6 match up perfectly. I also marked in color areas that could be spacing instead of ornaments to create a visual flow. And you can also see exactly what size slugs you need to round out the outer edges of the piece to square it up. Measuring everything insures you'll have a tight form; being off as much as 1 point can throw off the whole thing when it comes to locking it up! Do you need specific pica paper to create the above and sketch your ideas? No. But if it'll help improve your speed then give it a go! And remember... sketch those ideas and forms! Your printing will be stronger for it.